The BJP is preparing a list of bureaucrats who are toeing the line of the Congress and working in an unfair and impartial manner. Newer names are being added to it while those officials who have shown an improvement by shunning all prejudices are being deleted, former Chief Minister P.K.Dhumal said here today. The hills of Himachal Pradesh virtually sizzled as the mercury continued to shoot up across the state with the "queen of hills" recording its hottest day ever. The temperature of 31.5°C was the highest ever , beating the previous best of 31.4°C recorded on June 10,1995, according to head of the local MET office Manmohan Singh. The 1,500 MW Nathpa Jhakri project will be in a better position to meet the peaking demand of the power-starved northern states with the increase of the live storage capacity of the dam at Nathpa. The three-day convention on ‘Corporate Response to Climate Change’ organised by the World Environment Foundation concluded at the SM Convention Centre here today. A session named ‘A holistic solution for the ailing planet’ was held at the convention centre, which was chaired by Union Minister of State for Planning M.V. Rajasekharan. The melting of snowline, drying water bodies, change in rain patterns and the dying flora and fauna - the consequences of rising temperature and global warming were well depicted through various mudras in an Odissi dance performance by Kavita Dwibedi. The Himachal government will take steps to promote NCC activities in educational institutions to make it a mass movement in the state. State this while addressing the flag-in ceremony of the week-long All India NCC girls trekking expedition of the 1,050 cadets from 14 states which concluded today at the Kalyani helipad. Chief Minister Virbhadra Singh today called upon dentists in the state to serve in rural areas where a major chunk of the population lived. Inaugurating the two-day 114th general body meeting of the Dental Council of India at the fairlawns, here today. The state exchequer in the state is losing crores of rupees every year on account of IT (information technology) education being imparted in government senior secondary schools by a private company which was hired on contract. The company has been accused of amassing hefty fees from pupils studying in classes from IX to XI as they are bereft of proper infrastructure and internet facilities. Concerned over the aggravating problem of soil erosion and rapid ecological degradation due to construction of big hydroelectric projects in the upper Sutlej valley, the Forest Department has decided to revamp the catchment area treatment (CAT) plans to ensure that the most vulnerable stretches were taken up on priority. Residents of Dadahu, 35 km from here, led by president of Dadahu panchayat Mahesh Aggarwal and vice-president Amit Kumar Bhardwaj entered the Dadahu referral hospital last night and gheraoed the hospital staff for more than two hours in protest against the 'carelessness and deplorable attitude' of doctors and para-medical staff. The Himachal Pradesh SC, ST Government Employees' Association today urged the government to implement the 85th constitutional amendment in the interest of Dalits. The state executive expressed shock that despite repeated assurances by the Chief Minister, this right was still being denied to them. Three policemen, head constable Tara Chand Sharma and constables Rajeev and Anil of the Shimla police saved a woman from drowning in the Satlej at Sallapar, 22 km from here, last evening. Ami Chand (53), who runs a tea stall in Bhali village on the Pathankot-Mandi highway, raped a 17-year-old girl of the same village in his shop on Thursday night, the police said here today. Senior BJP leader and former Chief Minister Prem Kumar Dhumal on Sunday anticipated a snap poll in the hill state. “There can be a mid-term poll in Himachal Pradesh”, Dhumal, who trounced his Congress rival and state forest minister Ram Lal Thakur by over 80,000 votes in the Hamirpur parliamentary byelection recently, told reporters. The BJP is preparing a list of bureaucrats who are toeing the line of the Congress and working in an unfair and impartial manner. Newer names are being added to it while those officials who have shown an improvement by shunning all prejudices are being deleted, former Chief Minister P.K.Dhumal said here today. It had been found that quite a few bureaucrats had gone overboard to help the ruling Congress. He warned such officials to act fairly or face the music after the BJP returns to power. Commenting on the posting of four HAS officers as DCs, including that of Bilaspur, who had been directed to leave by the Election Commission, Dhumal said a government which did not learn by its own follies was sure to be wiped out. He said Chief Minister Virbhadra Singh who had termed him a non-resident Himachali had been given a befitting reply by the people in the Hamirpur byelections. The Congress defeat was indicated that the people of lower Himachal had outrightly rejected the rule of the CM. He took an exception to the large-scale shifting of IAS and HAS officers despite a ban on transfers. He was critical of the reinstatement of controversial ADGP B.S.Thind. He said though a section of the Congressmen talked of change in leadership the BJP wished the CM to stay on and ensure a complete ouster of his government in the coming Assembly poll. The city had recorded 31.3 °C yesterday. The minimum temperature also rose by 1°C to reach 22.5°C. Temperatures in the entire hill state were three to seven degrees above normal with Una recording the highest daytime maximum temperature at 44°C on Sunday. Una also recorded the hottest night at 23.5°C as compared to 22.8°C yesterday. The daytime maximum temperature at Sundernagar was 41°C while at Dharamsala it was 36.1°C. The maximum temperature at Kalpa in Kinnuar district rose to 27.3°C as compared to 25°C recorded yesterday while the minimum temperature climbed to 11.1°C. The daytime maximum temperature at Reckong Peo was recorded at 30.2°C, the highest- ever temperature recorded during the past one decade. The daytime maximum temperature at Bhuntar in Kullu district fell by a few notches to 38.4°C from the yesterday's 38.6°C. The minimum rose to 17.9°C as compared to 16.7°C recorded yesterday. The meterological department has predicted that the dry hot weather conditions were likely to continue for another 24 hours before isolated rain at some places. The continuing dry weather spell has created drinking water scarcity in various parts of the state following the drying up of several natural water sources and supply schemes. The hot spell has triggered numerous forest fires and columns of smoke could be seen rising from hills. The skyline has been obscured by a thick layer of smoke created by forest fires. The 1,500 MW Nathpa Jhakri project will be in a better position to meet the peaking demand of the power-starved northern states with the increase of the live storage capacity of the dam at Nathpa over the next two months. The Sutlej Jal Vidyut Nigam ( SJVN) has not been able to utilise the full storage capacity of the 62.5 m high dam at Nathpa, as raising the crest level of the spillway would have submerged the 126 MW Bhabha Power House located upstream. Consequently, the spillway crest level of the dam was kept at 1,485.5m (from the mean sea level), 10m below the maximum highest level, which restricted the live storage capacity of the reservoir to 111 hectare metre. This drastically reduced the peaking capacity of the project and it could only provide power for just over an hour. Engineers of the SJVN have found a solution to the problem which would enable them to make optimum utilisation of the storage capacity. They have constructed a 1.7 km tunnel on the right bank of the Sutlej to bring water from the Bhabha project beyond the Nathpa dam. By securing the outfall of the upstream project, the crest level of Nathpa dam spillway would be raised to the highest level of 1,495.5 m to help increase the live storage capacity to 303 hectare metre. The increased level will enable the project to provide peaking power to the over-stressed northern grid for more than three hours much to the relief of the deficit states. The crest level has already been raised to 1,492.5 m and with the erection of the last spillway gate over the next two months the reservoir could be safely topped upto 1,495.5 m.
The reservoir, which is filled upto a maximum of 1,485 m ( from the sea level), could now be safely topped upto 1,495 m. The reservoir will be filled to the maximum level over the next two weeks. 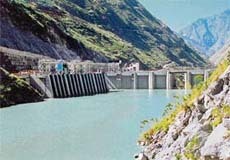 The impact of peaking power will be felt more during the lean winter months when the discharge in the Sutlej is reduced. Another benefit, explains general manager of the project N.C. Bansal, will be the increase in the length of the reservoir. It will be extended from 1.1 km at 1,485.5 m level to over 2.5 km at the highest level. The elongated reservoir will help in combating the problem of excessive silt as the water of the turbulent Sutlej will be slowed down considerably before reaching the intake at the dam allowing, more particles to settle down, he added. He said the project was designed for a silt level of 5,000 ppm. However, during monsoon, which is the peak generation season, the level even shoots up to 40,000 ppm and stays beyond the permissible limit for days together. As excessive silt caused extensive damage to turbines the Union Ministry of Power scaled down the permissible silt level to 4,000 ppm. Noting that an increase in tourist inflow contributed to pollution, Himachal Governor V.S. Kokje today asked the state government to take steps to deal with the problem. The state with just 63 lakh population is annually getting 70 lakh tourists who make a lot of pollution. The state must reassess its policies to cope up with the situation,” The Governor said addressing the valedictory function. He stressed on adopting new strategies to combat climate changes. The three-day convention on ‘Corporate Response to Climate Change’ organised by the World Environment Foundation concluded at the SM Convention Centre here today. A session named ‘A holistic solution for the ailing planet’ was held at the convention centre, which was chaired by Union Minister of State for Planning M.V. Rajasekharan. Winners of the Golden Peacock Occupational Health and Safety Awards and Golden Peacock Eco-Innovation Awards gave their presentations on the ocassion. In fact, most of the delegates and corporate representatives from across the country felt that the event was a complete a goof-up and many left the venue fuming. Leaving aside the politicians and other big shots whose names were mentioned in the schedule, most of the resource persons who were to deliver the sessions also failed to turn up. Even the chairman of the convention, Justice P.N. Bhagwati, did not attend the event. As a result, the whole schedule had to be squeezed down each day. While the brochures mentioned that 16 sessions would be held but hardly six to seven sessions were held. The representatives from corporates and public sector companies who paid heavily for the convention lamented that they were not given enough time to complete the presentations. While the organisers repeatedly claimed that the awards were given in a very transparent manner, the delegates felt otherwise. Since the convention turned out to be a disappointment to many, they preferred spending their time visiting tourist spots around the town. Regarding fewer delegates and politicians visiting the conference, he said, “Rather than asking us, why don't you ask the politicians why they did not join for such an important discussion?” he reverted. The dance exponent performed at the CSK HP Krishi Vishwa Vidyalaya here last evening. Dressed up in a green saree to convey the message on saving the environment, Kavita performed along with her three disciples, one of them a Japanese. 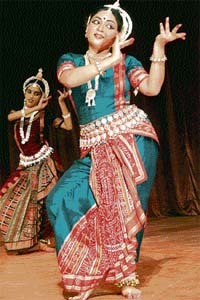 In a composition based on a poem by poet Kali Charan Patnaik, the Odissi maestro showed how human beings were themselves suffering from the excessive heat, a problem created by themselves. Through her graceful movements and expressions, she depicted shedding of flowers and killing of birds and animals and the destruction of their habitats. The Himachal government will take steps to promote NCC activities in educational institutions to make it a mass movement in the state. State this while addressing the flag-in ceremony of the week-long All India NCC girls trekking expedition of the 1,050 cadets from 14 states which concluded today at the Kalyani helipad, Chief Minister Virbhadra Singh said the government would follow the norms of the Union Ministry of Defence in respect of disbursement of the rank pay and allowances to the NCC officers and cadets during the centrally organised camps and courses in the state. He said it was according top priority to NCC activities with a view to inculcating a spirit of nationalism, discipline, patriotism and universal brotherhood amongst the youth. He said NCC officers should work with dedication and strive to acquaint the cadets with the rich cultural heritage of the country. He said these cadets were the ambassadors of peace and brotherhood and they should work to strengthen national unity and educate the people about environment related issues. The Chief Minister assured the organisers of all possible help for expanding its activities. He also awarded the participating cadets and went around exhibition stalls put up by different units. Deputy director general, NCC, Brigadier D.C. Katoch spoke about measures required to strengthen the NCC activities in a big way in educational institutions of Himachal Pradesh. He informed that ministry of defence had approved of 20 per cent reservation for the Officers Training Academy at Chennai for NCC girls from the current session onwards. He informed that the NIIT would be training 20 girl cadets from Punjab, Haryana, Himachal and Chandigarh for training besides, delivering career counselling and placement services to the NCC cadets. A website had been launched for the benefit of the cadets. Chief Minister Virbhadra Singh today called upon dentists in the state to serve in rural areas where a major chunk of the population lived. Inaugurating the two-day 114th general body meeting of the Dental Council of India at the fairlawns, here today, he said the state government would extend dental health facilities down to the primary health centre level by the end of the current financial year, to promote dental facilities in rural areas. He said dental professionals should be able to manage the oral health effects of co-morbidites and medications, interacting more often with other healthcare providers, social service agencies and institutionalized patients. There were wide variations in oral diseases and conditions among racial and ethnic groups, between poor and more affluent populations, between males and females, young and old, he added. All these along with a rapidly changing demographic profile, would require a dental workforce which was confident and competent to address both routine and uncommon oral problems, he added. He said dentistry’s future ability to promote oral health depended on its capacity to integrate and implement enhanced technologies into clinical practice, respond to changing patient needs and assure adequate supply of well trained dental educators and dental students. The imparting of IT education commenced in July 2001 by a Chandigarh-based DOEAC company, services of which were reportedly not satisfactory. The government had to terminate its contract to ensure better replacement, sources said. The substituting company, Electronic Corporation of India Limited (ECIL), as per the terms and conditions stipulated by the HP Government had performed well as they charged fees of Rs 97 per candidate. The company soon reneged on its commitment of providing better education with its satisfactory infrastructural facilities. The government then broke its agreement with ECIL and again hired the services of the delinquent company which was already blacklisted once by the HP government. The teachers who are professionally qualified to impart the IT education up to class XI are being paid a meager sum of Rs 2,760 per month. In many schools, there is only one computer teacher to undertake extensive teaching work without adequate number of functional computer equipments, said Surendera Kunwar, principal of local Govt Senior Secondery School. She said for poor handling of teaching work, the company recently was fined Rs 12,000 by school authorities. DOEAC now engaged up to April, 2008, by the government is reportedly dictating terms and earning a revenue of more than Rs 6 crore without providing the requisite number of computers as laid down in the charter. The school authorities charged the DOEAC visiting project in charge for not providing infrastructural amenities, sufficient number of computer sets, and adequate teachers. On the condition of anonymity a teacher said, the government-owned company should take due care of the optimum infrastructural facilities and provide satisfactory emoluments to hired teachers. Director of secondary education Anita Rao, however, admitted that flaws in imparting IT education were there, as the teachers had to teach more students than the stipulated norms. About the low salaries, she said it was the duty of the company to pay them well and get better work out of them. The projects being carried out for the rehabilitation of degraded areas as part of the CAT plans are not making much impact as is evident from the ever-increasing level of silt in the Sutlej. The silt content during rainy season remains high continuously forcing repeated shutdowns of the 1,500-MW Nathpa-Jhakri projects. Reckless dumping of debris, vertical cutting of hill slopes for construction of roads and other developmental projects and large-scale deforestation have destabilised the fragile strata. As a result, tonnes of muck was finding its way into the river silting up dams and causing extensive damage to the turbines. At present, CAT plans, involving an expenditure of Rs 173 crore, pertaining to six projects are under implementation and Rs 27 crore has been spent on these already. However, principal chief conservator of forests during his visit to Kinnaur district, where most of the projects are coming up, found that these plans lacked focus as a result of which these were not making a discernible impact. Some slopes were eroding at an alarming rate and required special attention. For instance, the area immediately downstream the Baspa dam had been severely affected due to the sudden release of water in the wake of flash flood in 2005. But required rehabilitation measures had not been taken. Glacial slides had made vast stretches in the Rakcham-Chitkul sanctuary prone to erosion, which was polluting the Baspa river. Trouble started around 9 pm when some residents spread the message that Shyama Devi of Chooli village, who had met with an accident, had been waiting for treatment for over three hours in the hospital. Shyama Devi was bleeding all this while though she was brought to the hospital for treatment at 6 pm. Another woman patient had also been waiting for treatment for long there. The agitators did not allow the hospital staff to leave the premises and brought the matter to the notice of Nahan SDM Sumit Khimta. It was only after the SDM assured the agitators that the matter would be thoroughly investigated to fix responsibility that the gherao was ended. The Himachal Pradesh SC, ST Government Employees' Association today urged the government to implement the 85th constitutional amendment in the interest of Dalits. The state executive expressed shock that despite repeated assurances by the Chief Minister, this right was still being denied to them. The meeting threatened to consider launching an agitation if this constitutional provision was not made in the monsoon session of the Assembly. The association demanded the scrapping of present PTA appointment policy as great injustice is being done to their categories. It demanded that district-level committees should be constituted in each district to fill these posts. By another resolution the association demanded that special sittings of departmental promotion committees should be arranged to fill the backlog of Dalit employees. Reports said Dharam Singh and his wife, Daya Devi, and their two children along with another relative were travelling in a taxi from Shimla to Mandi when their car stopped at Salaapar bridge for a while. Daya Devi went down to answer the call of nature. As soon as she reached the bank of the river, she fell into the gushing waters. These three policemen who fortunately reached there at that time immediately jumped into the river and saved the woman from drowning in the river. She is recuperating in the local district hospital. The parents of the girl lodged a report with Shahpur police station in this connection. Villagers nabbed Ami Chand after the father of the girl raised an alarm after the incident. As the village panchayat failed to sort out the issue on Friday, the police registered a case. The police arrested Ami Chand while the girl was sent for a medical examination. The girl belongs to a poor family who had left studies after her primary education.